Wolfgang Amadeus Mozart, baptised as Johannes Chrysostomus Wolfgangus Theophilus Mozart, was one of the greatest composers of the classical period. Born on January 27, 1756 in Salzburg, Mozart showed prodigious ability from his earliest childhood. At the age of 4 he could learn a piece of music in half an hour. From 1782 to 1785, Wolfgang Amadeus Mozart divided his time between self-produced concerts as soloist, presenting three to four new piano concertos in each season. Mozart is probably the only composer in history to have written undisputed masterworks in virtually every musical genre of his age. Around the end of 1785, Mozart began his famous operatic collaboration with the librettist Lorenzo Da Ponte. 1786 saw the successful premiere of The Marriage of Figaro in Vienna. In December, 1787, Emperor Joseph II appointed Wolfgang Amadeus Mozart as his “chamber composer,” a post that had opened up with the death of Gluck. Mozart became a regular at the court of Emperor Joseph II (1741-1790), where he wrote much of his greatest music. Mozart composed his last symphony (no. 41) in 1788. It is known as the “Jupiter” symphony. At 5 he was playing the clavier incredibly well. At the age of 6 he started playing in public and performed before European royalty. At 6 he also began composing, writing his first symphonies at the age of 8. Mozart finally achieved an unceremonious dismissal from the archiepiscopal court in 1781, and thereafter became one of the first musicians in history to embark upon a free-lance career, without benefit of church, court, or a rich patron. In the summer of 1781, it was rumored that Mozart was contemplating marriage to Fridolin Weber’s daughter, Constanze. The couple was finally married on August 4, 1782. In 1782 completed the opera Die Entführung aus dem Serail (“The Abduction from the Seraglio”), which premiered on 16 July 1782 and achieved a huge success. The work was soon being performed “throughout German-speaking Europe”, and fully established Mozart’s reputation as a composer. Between 1790 and 1791, now in his mid-thirties, Wolfgang Amadeus Mozart went through a period of great music productivity and personal healing. Some of his most admired works – the opera The Magic Flute, the final piano concerto in B-flat, the Clarinet Concerto in A major, and the unfinished Requiem to name a few – were written during this time. the Emperor Joseph II, who had died in 1790. 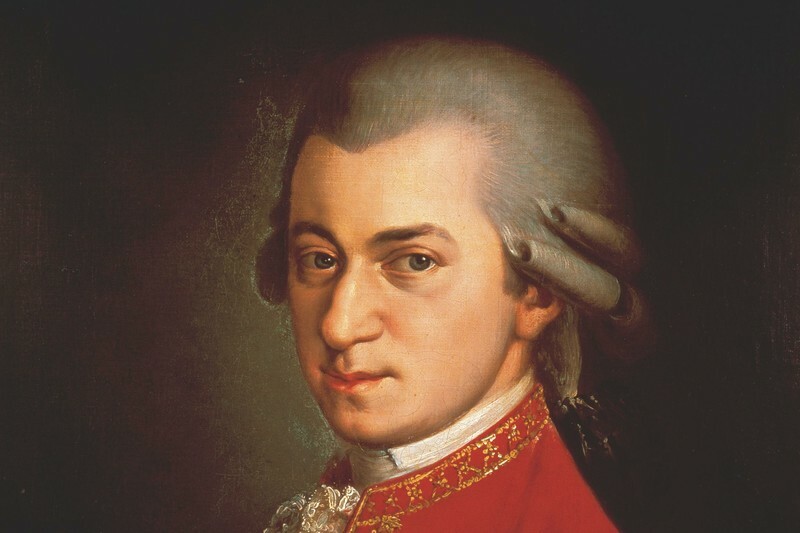 In late November 1971, however, Mozart became seriously ill and died in the small hours of 5 December at age 35.
cause as severe miliary fever, referring to a skin rash that looks like millet seeds. No one is sure where Mozart’s body is. He was buried according to the custom of the time in a simple grave. He had no graveside ceremony or even a grave marker. Mozart composed over 600 works including: 21 stage and opera works, 15 Masses, over 50 symphonies, 25 piano concertos, 12 violin concertos, 27 concert arias, 17 piano sonatas, 26 string quartets, and many other pieces. In the decades after Mozart’s death there were several attempts to catalogue his compositions. Finaly Mozart’s compositions were catalogued in the 19th century by Köchel. The soundtrack to the 1984 film Amadeus made it to #56 on the Billboard album charts, making it one of the most successful classical music albums ever. First coined in 1993, the “Mozart Effect” is the belief that listening to Mozart’s music can improve a person’s IQ. Beginning in 1782 with the Singspiel Die Entführung aus dem Serail (The Abduction from the Seraglio), Mozart began turning out one masterpiece after another in every form and genre. Mozart could listen to music just once and then write it down from memory without any mistakes. He was constantly traveling all over Europe with his father, Leopold Mozart (1719-1787), a violinist, minor composer and Vice-Kapellmeister at the court of the Archbishop of Salzburg. The musical feats and tricks of young Wolfgang were exhibited to the courts (beginning in Munich in 1762), to musical academicians, and to the public. A visit to Munich, Mannheim and Paris in 1777 and 1778 brought no substantial offer of other employment and by early 1779 Mozart was reinstated in Salzburg, now as court organist. With no prospects of a job, Mozart dejectedly returned to Salzburg in 1779 and became court organist to the Archbishop. In January 1781, Mozart’s opera Idomeneo premiered with “considerable success” in Munich.